The countdown to #purplereignbakeoff begins! Here are our star bakers and their winning Prince-inspired creations, which will be competing to take home the grand prize of £500 or a Kitchen Aid Mixer, sponsored by 8th Light. 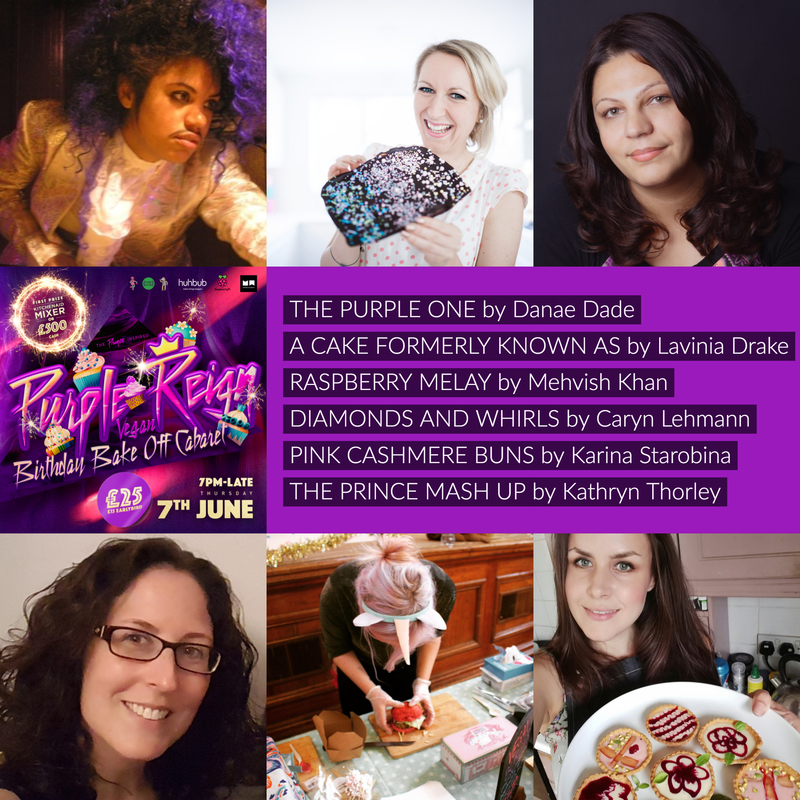 Get your ticket to Purple Reign: The Prince-inspired Birthday Bakeoff Cabaret here – tickets only on sale until Monday 4th June. Danae is the founder of Cookie&Biscuit, which started as a small batch bakery in South London in 2013, as a way to satisfy her sweet tooth with healthier alternatives. Things took a savoury twist when The V Spot supper catering launched in Autumn 2017, serving yoga brunches, supper clubs and private events. She once dressed up as Prince for Halloween, causing hysteria in the streets of San Francisco. Prince has inspired me to just be me, to not be swayed by the opinions and actions of other people, but instead to stay my course, and be true to myself. Live intentionally and spread love. Lavinia is the founder of Baking Time Club, which provides customers with unusual and exciting items for the kitchen, and magical baking ingredients like Purple Prince Sparkles! Prince has inspired me to be who I want to be, and to dress how I want to dress, his outfits for events and music videos are amazing. There’s a particular cloud print suit he wears in the Raspberry Beret video, which is awesome. Mehvish runs Heron’s Nest, which boasts bespoke home-made cakes to private order from the simplest ingredients. Heron’s Nest supplies Compôtes and The Currant, amongst other cafés. Her creations are made with love and elegance, and have brightened up many a special occasion. I grew up listening to Prince, went to his concert and danced around my room for hours listening to his music. He was one of my earliest influences, musically. Favourite Prince Song: Raspberry Beret. Caryn is originally from Canada. She met her British husband in Toronto and moved to London in 2008. Now she’s British too. She’s a teacher, formerly a school guidance counsellor. She works part-time supporting students at a local college, with the rest of her time kept busy by her two children (5 and 7 years). She loves baking with her kids and making creations and cakes for friends and family. Prince has inspired me to be true to myself; to be brave enough to believe in myself, to express myself, and to just be “me”. Prince has inspired a generation to accept each other, embrace our differences and have love for one another. Karina is a content manager at a big tech company and a journalist who likes to bake pink vegan buns in her free time for her vegan burger business. Prince inspired me by being the crazy charismatic star that he was. Kathryn is The Pop-up Baker, offering baked goods in a venue near you. She’ll be working on exciting South London community projects, combining baking and rehabilitation – watch this space! Since Prince’s death it has come to light how much he secretly donated to charity, especially grass roots projects. This is inspiring! These amazing women are baking up a storm to help Code Club UK serve 100,000 kids. Support the cause by getting a ticket to the bake-off, by donating online or by texting PRPL76 £5 to 70070.